The humble carrot. My fridge is chock full of them right now. You can cook them in a million ways – they come in a rainbow of colors and are packed with healthy nutrients. As a storage crop, locally grown carrots are available year round in Vermont. 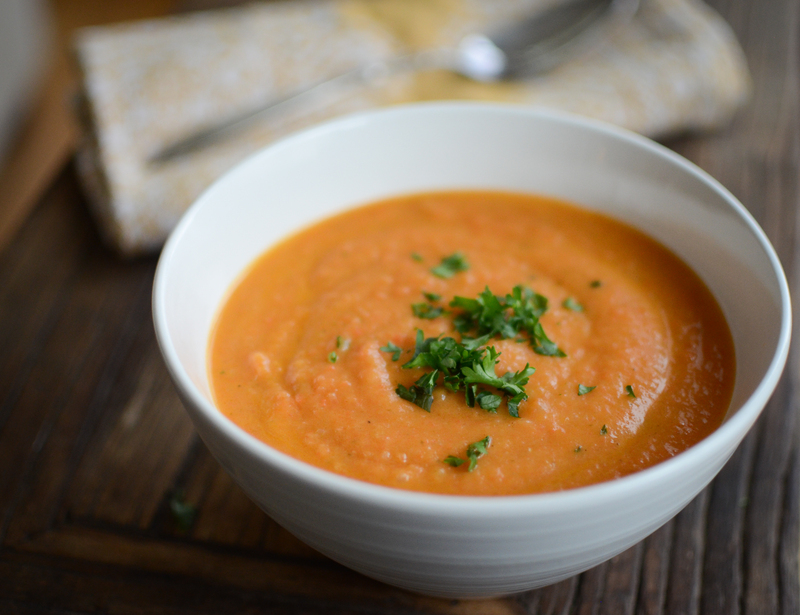 This super easy and delicious Carrot Soup is a classic and essential recipe, with bright, clean flavors and a velvety texture. I make it at least once a month. It’s simple, and chances are you’ll always have the ingredients hanging around your kitchen. You can build on this basic recipe by adding ginger or curry flavors, or detour into Thailand with the addition of coconut milk, Thai basil and chopped peanuts. Or simply leave out the cream for a dairy-free option. 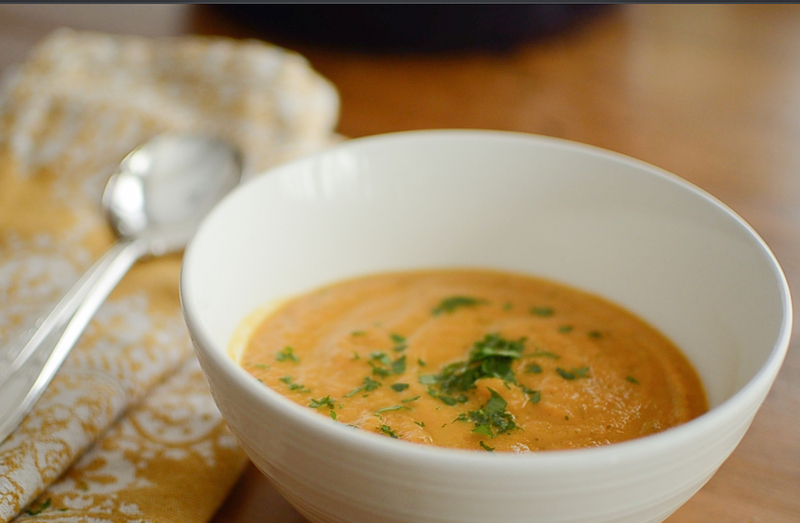 We are partial to this soup exactly as is, no embellishment needed. As with all of my very favorite recipes, I got this one from my mother, who’s been making it for our family for decades. 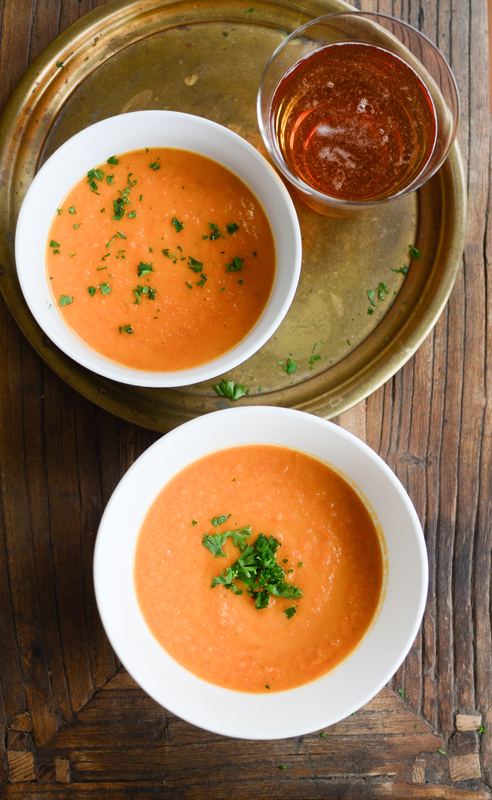 This creamy carrot soup calls for a hoppy drink – how about Green Mountain Snakebite! To find out what a Green Mountain Snakebite is and to get the recipe, sign up at the bottom of the page and download my free cocktail ebook, 7 Classic Cocktails with a Twist of Vermont. 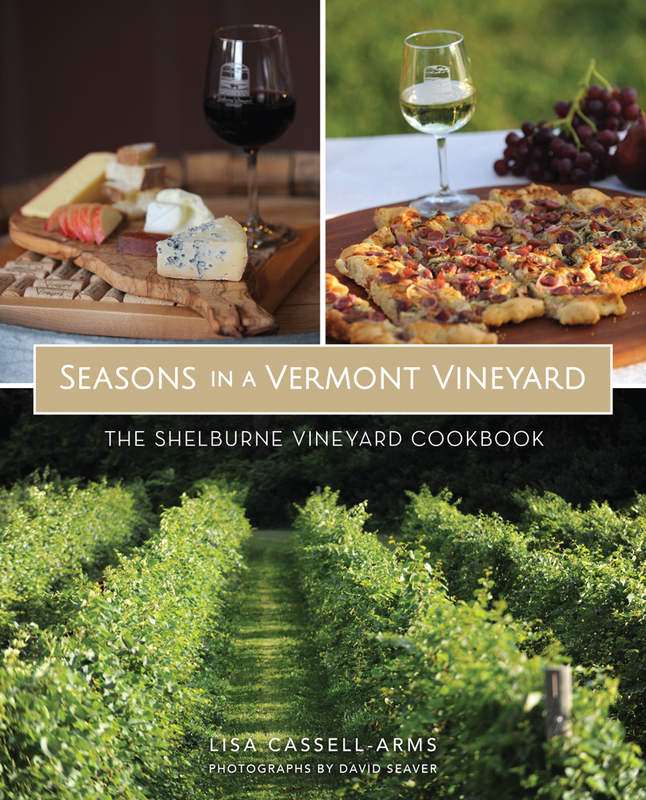 And thanks to my son for helping to shoot and edit our very first Seasons in Vermont video! 2 or 3 dashes Sriracha, if desired, and I do! Melt the butter in a large soup pot over medium heat. Add the onion and sauté until translucent. Stir in the garlic, cover the pot and simmer for about a minute on low. Don't brown the garlic. Add the carrots, potato and tomatoes and parsley or basil and sauté for a few minutes longer. Stir in the chicken stock and salt and pepper to taste. Bring the soup to a simmer. Cover, reduce heat to low and simmer for about 30 minutes, until carrots and potatoes are tender. Remove soup from the heat and allow to cool for a few minutes. In batches, purée the soup in a food processor until velvety smooth. Pour the puréed soup back into a clean pot. Over low heat, whisk in the lemon juice, half and half (or yogurt) and the Sriracha (definitely) Bring to a simmer and then turn off the heat.